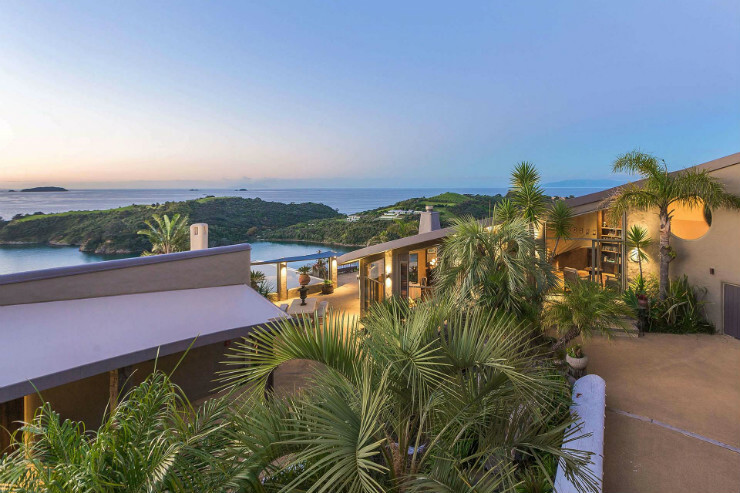 Waiheke Island is in the Hauraki Gulf of New Zealand, just 21km from downtown Auckland, and yet you can feel a world away, with its beautiful beaches, olive groves, wineries, and stunning landscapes with view across the Hauraki gulf back to the city. 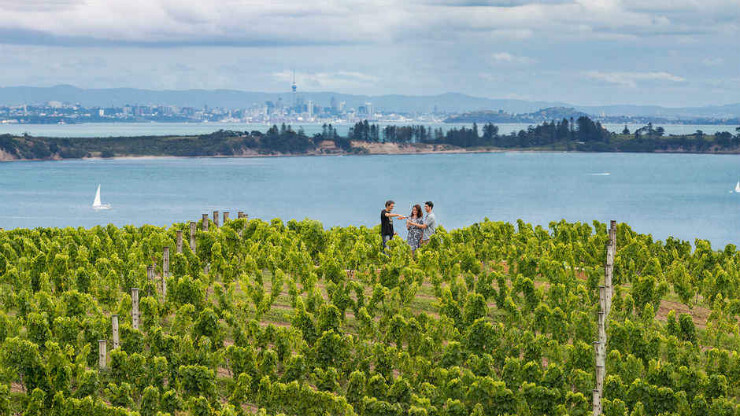 Waiheke is often said to have it’s own micro-climate always a few degrees warmer than Auckland city, which makes it perfect for the production of olives and wine, water sports, and outdoor life! Getting to Waiheke is easy, there are very regular passenger ferries from downtown Auckland to Matiatia Wharf, the journey takes only 35 minutes and they run from 6:00am through until midnight, no pre-booking is required although its advisable at peak times, the cost for an adult return ticket is NZ$35. There are also car ferry’s from Auckland city and Half Moon Bay in East Auckland, these need to be pre-booked and are less frequent, running three times a day from the city to Waiheke. 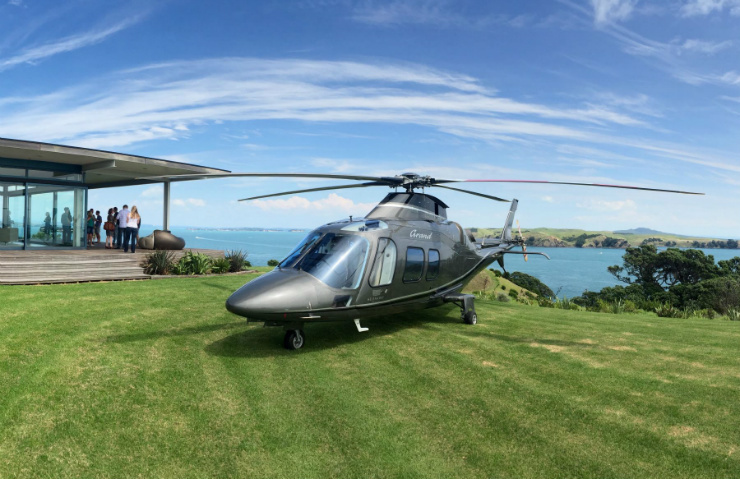 If budget allows you can take a helicopter direct from Auckland Airport to your accommodation on Waiheke island in only 12 minutes, or a little longer if you add in a scenic detour. Once on Waiheke Island there are several options for getting around, you could take the car ferry and bring your rental or private car across. Alternatively the local bus service is very good, the buses run regularly around the island and meet ferry arrival and departure times. The various routes follow main key roads with stopping points near most of the island’s important locations. This stretches as far as Onetangi beach in the east and includes the other Northern beaches and the Southern Rocky Bay & Te Whau area’s. You can purchase an “All day Bus Pass” allowing unlimited travel on the day for $10.00 per adult, so you can hop on and off at different locations. There are a few companies that hire bikes on the island, which is a great way to get around, there are also E-Bikes available to help with those hills! An old style retro scooter or moped is also very a cool way to get around the island, the roads are fairly quiet and easy to navigate. There are a couple of car rental companies on the island, pre-booking is definitely recommended. 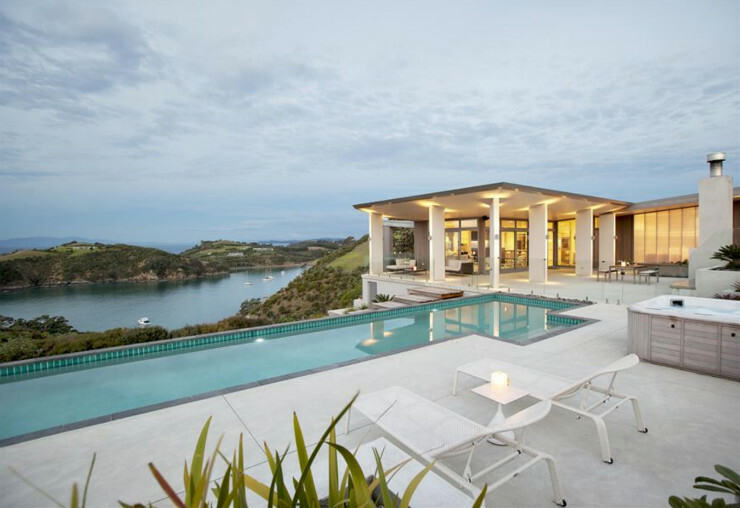 Luxury Adventures have selected some very special places to stay on Waiheke Island to suit most budgets. From boutique luxury lodges, vineyard accommodation, cosy bed & breakfasts and luxury private homes, talk to our team about which option suits your needs. – Marino Ridge, hosted by Peter & Caroline this luxury boutique lodge has three luxury suites, and stunning ocean views. – The Boatshed A five star small luxury boutique hotel – located at Oneroa Bay, The Boatshed offers a authentic New Zealand seaside experience. Each of its luxury suites are private and have ocean views. – Breakfast on the Beach is a lovely modern waterfront property, only 30 meters to the beach, with access to kayaks and a spa. – Delamore Lodge is premium luxury lodge accommodation located not far from the Matiatia ferry terminal facing north with excellent views over the Hauraki Gulf. 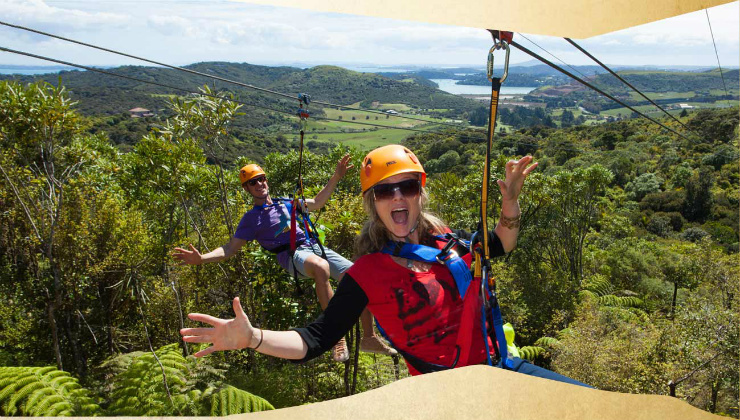 Waiheke is predominately known for its wine and beaches, but there are also lots of other activities available. With dozens of vineyards and wineries, many with their own restaurants you are spoiled for choice! A good way to visit the wineries is on a guided tour, depending on your budget and personal preferences either a group or private tour. As these tours often include tastings and chats with wine makers, and sometimes platters or lunches. The Luxury Adventures team work with a select group of experienced tour operators that can offer tours to suit most requirements and would be more than happy to help plan your tour. A cool way to get around the wineries is by bike, if you are feeling fit as there are a few hills on the island! Or if you want to take it easier there are e-bike options. You can hire bikes, pick up a map and head off on your own or join a bike the vines type tour. 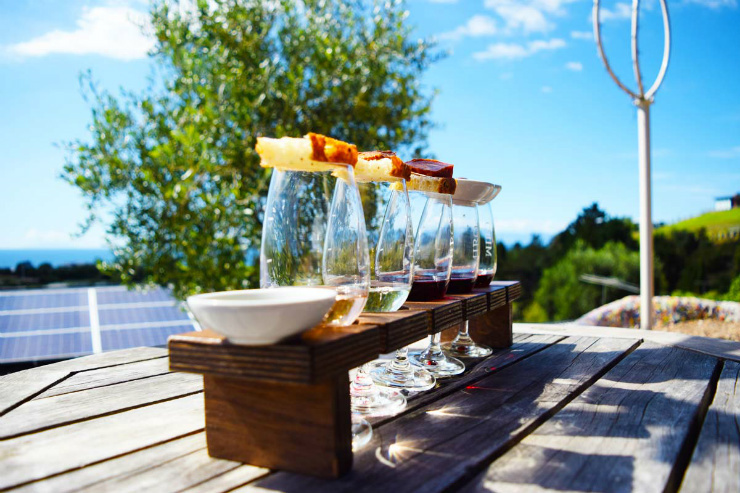 Most Waiheke wineries are open year round, it is sometimes necessary to pre-book tastings especially at the smaller boutique wineries. Waiheke is also home to stunning beaches, Oneroa Bay is one of the most popular and a firm favourite with boaties. Sandy Bay is on the northern coast of the island, is a great beach with safe swimming and one of the few beaches where boats can be launched all year round. If you’re lucky enough you might see a pod of Orcas swimming into Sandy Bay to feast on the resident stingrays. Palm Beach is another of Waihekes northern beaches and has fantastic white sand and safe swimming. Onetangi Beach, with 2.5km of beautiful white sand is Waiheke’s largest beach. A great swimming and fishing beach with surf, and offers a beach side restaurant. Onetangi is also home to the Onetangi Beach Races, Auckland’s most iconic event which has been going for over 100 years. Waiheke is a water sports paradise, great for kayaking, paddle boarding, sailing, fishing and windsurfing. For those of you that prefer land based activities, there is plenty to keep you busy, with horse riding, bike tours, ziplining, hikes, mountain biking and golf to name a few! You are spoiled for choice with great restaurants on Waiheke Island! – Mudbrick, also a winery Mudbrick has a A la carte restaurant as well as a more casual bistro, it also offers great views of the ocean. – Casita Miro offers cuisine of Spain and the Mediterranean Rim. Casita Miro is all about shared dining experience and is perfect for a fun, relaxed and social dining experience. – Stoneyridge, again also a winery and a perfect spot for a romantic lunch. – The Oyster Inn, as the name would suggest offers fresh seafood and shellfish. Some of the island restaurants close in the off season and can be busy in the peak season, and therefore we always recommend making reservations ahead of time where possible. Waiheke is host to some fantastic events. There are regular farmers markets, at the weekends during the summer months. During November Waiheke is host to the Te Matuku Oyster Festival, which celebrates New Zealand’s finest oysters with a day of cooking demonstrations, wine, craft beer and, of course, beautiful food. Also in November is the walking festival, a free event with approximately fifty walks! During the summer months December through to February there is a sculpture festival where sculptures from New Zealand artists are displayed on the headland Pavilion, in beautiful Matiatia Bay. Onetangi beach races is an iconic family day out with Sealegs, ponies, Segways and tractors all racing on Onetangi beach. 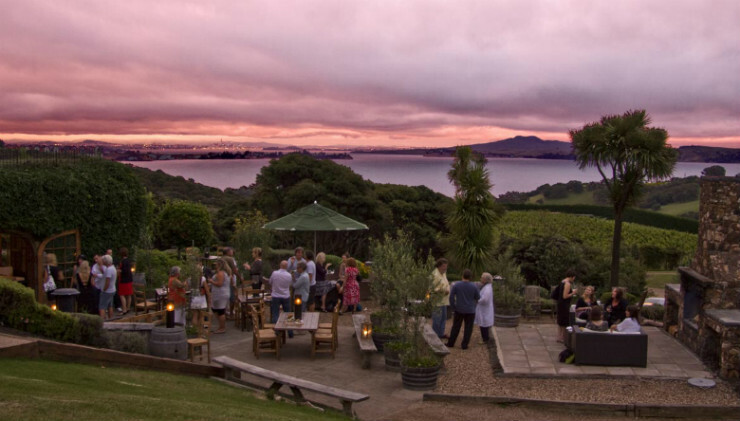 Of course Waiheke holds its own food and wine festival usually in April, giving locals and visitors the chance to taste locally produced taste boutique Waiheke wines and artisan food in one location. The Waiheke Jazz festival is usually at Easter time and showcases both New Zealand and international artists.